Today is Valentine’s Day, but it also marks two important Toronto hockey anniversaries. 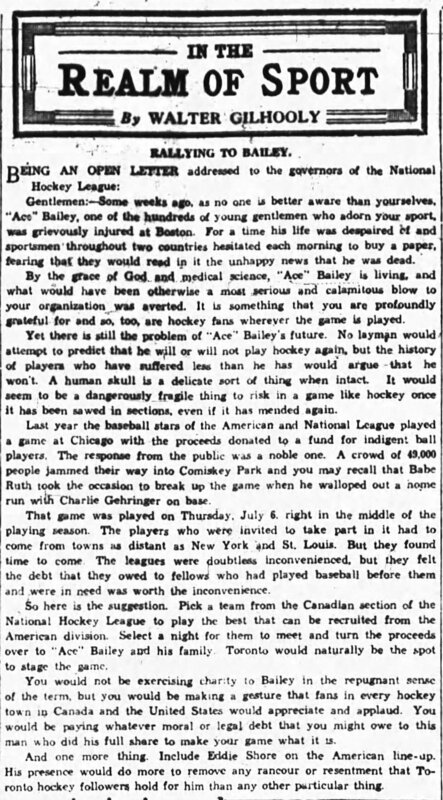 Ninety years ago, on February 14, 1927, the group assembled by Conn Smythe made its first $75,000 payment (they’d already put down a $10,000 deposit and would pay the final $75,000 over the next 30 days) to purchase the Toronto St. Pats. The deal was ratified that day at a meeting of NHL officials at Toronto’s King Edward Hotel. The team played its final game under its old name at Detroit the following evening before making its debut as the Maple Leafs at home against the New York Americans on February 17, 1927. Today also marks the anniversary of the Ace Bailey benefit game; the first All-Star Game in NHL history, played at Maple Leaf Gardens in Toronto 83 years ago on February 14, 1934. Recently, I wrote about some of the back story behind the Howie Morenz Memorial in 1937. Today, here are some of the behind-the-scenes discussions that led to the Ace Bailey Game. I’m sure that many of you reading this will be familiar with the basic story of the Ace Bailey Incident. If not, my friend and colleague Kevin Shea wrote about it recently in the Toronto Star. There’s also an entire chapter devoted to it in my book Art Ross: The Hockey Legend Who Built the Bruins. Briefly, Bailey was a star for the Toronto Maple Leafs who had his career (and almost his life) ended in a dirty hit from behind by Bruins legend Eddie Shore at the Boston Garden on December 12, 1933. Bailey fell and his head struck the ice. His skull was fractured, and over the next few days there was a blood clot discovered on the left side, and extensive hemorrhaging on the right side, of his brain. His chances of survival were poor, but a series of operations performed by a Boston specialist saved his life. 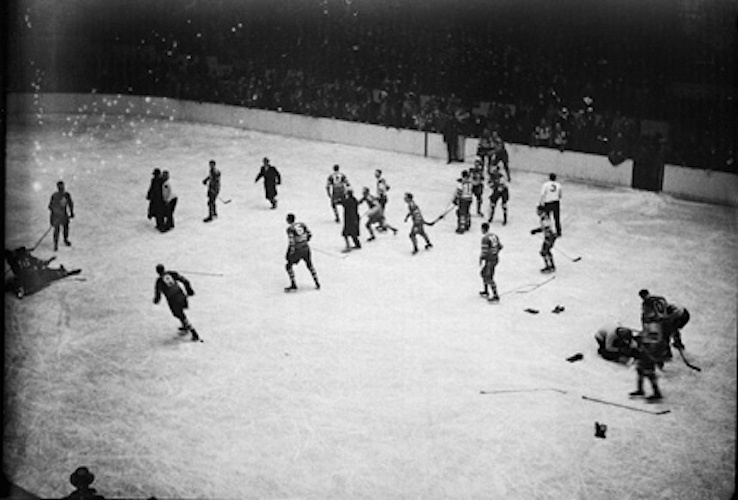 The scene on the ice at the Boston Garden, with Ace Bailey down on the left and Eddie Shore, after being punched by Red Horner, at the right. Photo courtesy of Art Ross III. 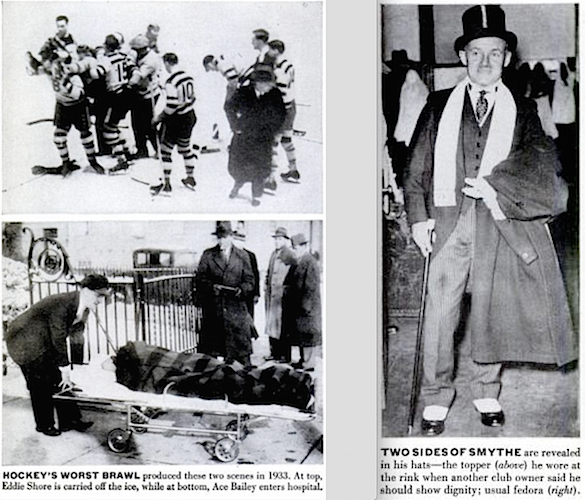 Conn Smythe – who had stayed at Bailey’s bedside in Boston for several days – was incensed at losing Horner for any time at all, given that they had already lost the services of Bailey. He also didn’t feel that his Maple Leafs – who’d paid out about $2,500 by early January – should be on the hook for all of Bailey’s medical expenses. The Bruins had already donated the gate receipts from their next home game on December 19 (reported first as $6,642.22 and later as $6741.21) directly to Mrs. Bailey, but the Toronto owner wanted more. Photos from the pages of Life Magazine in a story about Conn Smythe from 1955. On January 9, 1934, Smythe, backed by the Ottawa Senators and Montreal Maroons, requested that NHL President Frank Calder call the meeting. It took place at the Lincoln Hotel in New York on January 24. Despite reports that there would be some discussion of extending Shore’s suspension, compensation for Bailey was the only issue. The Boston Globe reported that the meeting lasted three hours. The Toronto Star said five hours. The governors clearly believed Bailey was entitled to something, but seemed worried about setting a precedent that would make teams financially liable for injuries to an opponent. 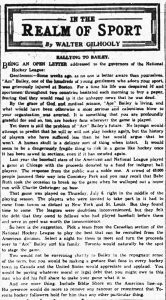 In the end, it was James Strachan of the Maroons who suggested a benefit All-Star Game, although Ottawa Journal sports editor Walter Gilhooly had already written a similar proposal. The NHL’s announcement was made when the governors broke for lunch at 2 pm. Smythe declared himself satisfied with the action. Governors as it appeared in the Ottawa Journal on January 8, 1934. In the end, a capacity crowd of 14,074 saw the Maple Leafs beat the All-Stars 7-3. They paid a total of $20,909.40 for their tickets, all of which was turned over to Bailey and his family. I hate to think how much that hospital stay would have cost today! I recall someone calling for a priest (if Bailey was a Catholic) to administer the church’s last rites. Was Bailey a Catholic? It probably would not have been hard to find a priest in 1930’s Boston.